Disclosure: Post sponsored by Hy-Vee and ALIVE Influencer Network. All opinions are mine. I teach coupon classes locally and people are always shocked to learn that Hy-Vee is one of my stores of choice to save money on groceries. When you shop their weekly deals, use digital coupons and rack up Fuel Saver points you can big money at Hy-Vee! Can you believe I’ve paid only $0.20 to fill up my husband’s entire gas tank for his truck? And, that I’ve done that multiple times over the past few years!? Today, I am going to share how to shop Hy-Vee to save big on your grocery bill and explain how their Fuel Saver program really works. Before you begin shopping at Hy-Vee, you will need their free loyalty card to access digital coupons, special sales and the Fuel Saver program. You can get a card at any Hy-Vee store customer service center or Hy-Vee gas. Once you have your card, register it online to activate and select your Hy-Vee location of choice so you can load coupons and track your Fuel Saver points. Bonus, every time you scan your Perks card at checkout, you have a chance to instantly win random freebies! Several of my readers have won free pizzas or cookies just for using their Perks card. Hy-Vee recently launched their new Hy-VeeDeals.com website where you can browse deals and savings at Hy-Vee stores. The weekly print ad only shows a small portion of what’s on sale, so I highly recommend checking out their site to find all the sale items before you plan your grocery trip. The site is mobile friendly, so you can access it on your smartphone or tablet. On Hy-VeeDeals.com, make sure to check out their digital exclusive ad and Fuel Saver ad! You can also search the digital ads by department or type in a specific item. Or, click ‘What I buy’ and it will display sales on items you’ve purchased at Hy-Vee in the past. How’s that for convenient? When browsing the online ads, simply click ‘add to list’ to create a digital shopping list that you can print or email to yourself. If you create the list within the Hy-Vee app, this list will be available on your app while you shop and you can even pull up a map to easily find each item at your preferred Hy-Vee! I get lots of questions on how their Fuel Saver program works. It’s really easy once you get the hang of it and program has saved customers over $17 million and counting to date. Basically, the Fuel Saver points you earn are a discount on each gallon of gas you pump, up to 20 gallons per fill up. The Fuel Saver points expire 30 days from when you earned them and there is NO limit on how much Fuel Saver you can earn. If you have enough to cover the entire cost of gas and then some, the additional Fuel Saver just stays on your card until your next fill up or until it expires. The lowest price you can pay for gas at Hy-Vee is a penny per gallon. A penny per gallon! That’s amazing! Here’s an easy way to figure out your savings. Simply multiply the amount of Fuel Saver by the number of gallons you will fill up and that is your savings on the individual item. For example, we always fill the 20 gallon limit, so a $0.01 Fuel Saver is a $0.20 total discount, a $0.10 Fuel Saver is a $2.00 total discount and $1.00 Fuel Saver is a $20 total discount and so on. If you have a smaller tank, just multiply the Fuel Saver by the gallons of gas you plan to fill up to find your total discount on the item. One simple way to earn Fuel Saver points is to watch for Fuel Savings bonus days, like spend $50 on groceries and get an extra $0.10 per gallon. Sometimes the Fuel Saver may be on meat purchases or alcohol and is an easy way to get extra savings! You can check your Fuel Saver point balance and expiration dates anytime on the Hy-VeeDeals.com website or on the Hy-Vee smartphone app. Here is an example of recent Fuel Saver deals at Hy-Vee from late March 2016 to better illustrate how the program works. 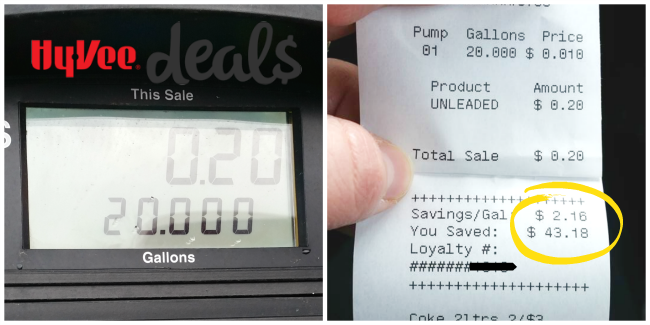 I shopped the sales and took advantage of the Fuel Saver program. I purchased 45 items for only $37.49 and I earned $1.22/gallon in Fuel Savings. Since I know we will use the 20 gallon limit, that’s a $24.40 savings at the pump. So, after factoring in Fuel Savings, these groceries cost $13.09 and I only used 5 coupons total (4 paper and 1 digital – $3.50 discount). I figure I have to pay for gas no matter what and I’d much rather take that $24 from my gas budget and add it to my grocery budget and get more food for the family and save! Makes sense to me and definitely helps keep our fridge and our gas tanks full on a budget. Hy-VeeDeals.com offers hundreds of digital coupons you can load directly to your card. At checkout, simply scan your card and the coupon savings will come off automatically. Hy-Vee digital coupons are manufacturer coupons, so you cannot combine them with paper coupons. But, that’s good news, because it means less time clipping coupons for you. I highly recommend you follow the social media channels for Hy-Vee corporate and for your preferred Hy-Vee location, especially their Facebook pages. Most individual Hy-Vee stores have their own Facebook fan page and will post special deals just for that store location or even have really great giveaways! I recently won a charcuterie and cheese tray from a local Hy-Vee Facebook page. In the past, I have even seen them give away Husker football tickets. Now, that would be an awesome prize! You can follow Hy-Vee corporate on Facebook, Twiiter, Instagram or Pinterest for more deals, recipes and offers. Speaking of winning, one lucky person will receive a $50 Hy-Vee gift card! Simply enter using the Rafflecopter form below. Giveaway ends Sunday, May 15. Good luck! What’s your favorite way to save at Hy-Vee? I don’t visit Hy Vee as often as I should. I will now that up understand it better. Thank you for the awesome tips. This will make it much easier to find those fuel savers! Really need to shop here more! I don’t do the majority of my shopping at HyVee but I do make sure to hit up their awesome 1-day/4-day sales! Your advice will make me look at doing more of my shopping there. Thanks! I save money by using coupons. I like the new Hy-vee deals website because it will simplify my process for saving money. I save money at Hyvee by shopping their awesome sales & then use my coupons along with the sales. I also save money on gas at Hyvee by using their Fuel Saver Program which saves us a lot on gas! Love the Fremont Hy-Vee store. Always lots and lots of great deals and super savings. I save with Hy-Vee deals, weekly ads, digital coupons and exclusive sales. I like using coupons with their 4-day sales. Really adds up! Super excited about this HyVee giveaway! I try to utilize their fuel saver items to fill out my grocery list. Oh I have never been to Hy-Vee before, we have a brand new one opening by us soon! I cannot wait to use the coupons and fuel perks! There is a Hy-Vee opening soon in our neighborhood, I can’t wait to use these tricks to save money! Love their fuel saver. Need to use their digital coupons more often. 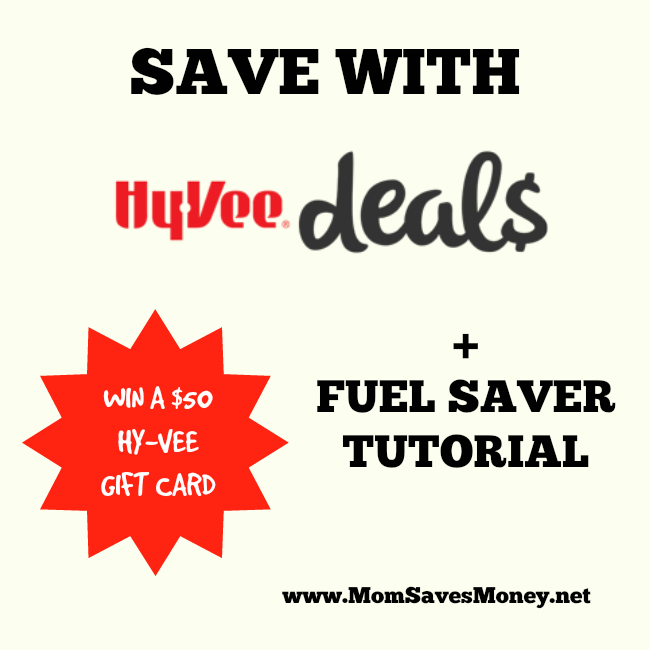 HyVee always has great deals – I just wish the Fuel Saver was more than a one-time discount! love to see how much fuel saver I can get! Fuel savers are awesome! I am ready to start taking advantage of grocery delivery too! thanks for the post–I’ve been too busy/lazy to check into fuel saver program. Love Hy-Vee! I worked there for 7 years through high school and college. Their fuel saver program is one reason I return there weekly. I always buy gift cards from Hy Vee for the fuel saver points. I’m already buying them, might as well get a little something back. Every little bit helps! I love to shop Hyvee for their great sales. Saves me alot of money. I use fuel pts to save at HyVee. I always shop the loss leaders! LOVE hyVee!! Thanks for all your savings tips!! Thanks for the chance to win gift card! I love shopping at hyvee and am always on the lookout for their specials. Love the giveaway and Hyvee! I’ve filled my tank 5 times in the last couple months for $.01 per gallon! Love saving with the fuel saver! I love Hyvee! The fuel savers card is a bonus! Coupons used on a fuel saver deal make me very! I finally used my saver card and loved my gas savings! I go for the Tuesday Chinese Buffett at Hy-Vee because it’s much cheaper! I love HyVEE’s helpful smiles!! HyVee has amazing specials each week. I can hardly wait until the new ad comes out on Wednesdays! I save at Hy-Vee by stocking up on their amazing sales!! I love shopping their 2 or 3 day sales when I can save the most or when they have awesome fuel saver deals! I use coupons, digital coupons, ibotta, and the fuel saver! Love my Hy-Vee, staff is always friendly and helpful. I save by shopping their sales and using coupons! 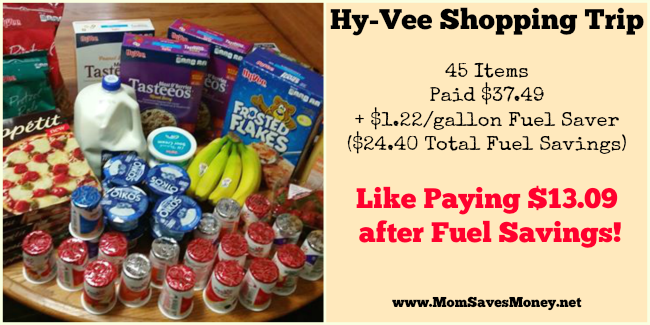 I love saving money at Hy-Vee using coupons and shopping the great Fuel Saver deals! I save close to $1,100 last year using fuel saver!! That’s amazing! Great job saving $$!